In "Learning and teaching through the Internet" (Philippine Daily Inquirer, 30 January 2006), Manuel L. Quezon III writes that "Schools are increasingly incapable of adequately investing in books, and even when they have decent libraries, students tend to go to the Internet rather than books for information." Quezon suggests that teachers should meet their students where they are, instead of forcing them to learn the way their parents did. He gives examples of websites and blogs that teachers and students can use (some were even created by students!) and provides links on his own blog. The movie Brokeback Mountain is expected to garner the most mentions when nominations for the 78th Academy Awards (a.k.a. "Oscars") are announced on January 31. The screenplay for the movie was based on a short story by Annie Proulx that was published in the New Yorker on 13 October 1997. The story was eventually published as part of Close Range: Wyoming Stories , a collection of Proulx's short stories. If you would like to read the short story on which the movie is based, the full text is available here. Just in case the New Yorker asks those who posted the story to take it down, you can always check the cached version (Google, Yahoo; what's a cache?). And then if you like the story so much, I suggest you Furl It, so that you'll always have your own copy even if the webpage disappears. You can watch the movie's trailer on the official website or on YouTube. The Asia-Pacific Conference on Library & Information Education & Practice (A-LIEP) will be held in Singapore, 3-6 April 2006, a week after the General Conference of the Congress of Southeast Asian Librarians (CONSAL) is held in Manila, 25-30 March 2006. A-LIEP is quite possibly "the first LIS conference focusing on the Asia-Pacific region." Speakers and participants will be coming from North America, Europe and, of course, Asia. Filipino librarians presenting papers at A-LIEP include Emmy Ballesfin, Lleuvelyn Cacha, Lourdes David, Dante Perez and this blogger. Incidentally, I will not be actively blogging until the end of January because I need to finalize my paper for A-LIEP, among other things. Online registration for the conference is not yet available, but it is expected to be up by February 1. Registration fees are SGD 400 (approx. USD 247) on or before February 15, and SGD 450 (approx. USD 278). Pre-conference workshops are also available for a separate fee. By the way, if you've been following the firestorm started by Jenny Levine on the other side of the Pacific regarding speakers' conference registration fees, it's interesting to note that CONSAL will waive registration fees for all speakers, while A-LIEP will provide complimentary registration only for invited speakers and a few others. I mention this, however, not as criticism. I always just assumed that speakers got in free. But after all that I've read on the subject, I guess that there are many different ways of dealing with conference speakers. For more about the controversy, please see Library Journal's summary. In the meantime, allow me to do some stereotype-busting by calling your attention to Dutch Engelbrecht—a.k.a. 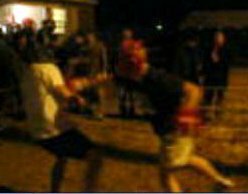 Librarian Barbarian (that's him in the black shirt)—who actually challenged a US Marine in a boxing match. He still seems to have all his marbles intact (and has the award to prove it), but if you look at the interview he conducted with himself (! ), you'll see that there's a moral to this story: "Never plan events while drinking." If you'd like to see a librarian take matters—and not just books—into his own hands, download the videos: Round 1 2 3 Wrap-up (right click on your mouse and choose "Save target as"; from Michaelcosm's post on 2 January 2004). Other accounts of the match are here and here. Are You Really a Librarian? Is it what you know that makes you a librarian? Or is it how you behave? If you think it's the former, then take the "Are You a Librarian" test. If you think it's the latter, check out "You know you're a librarian when..."
The latter I believe is a better "test" because I smiled a lot. And if you don't understand what I mean by that, I suggest you check out the second link. 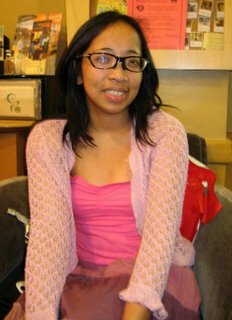 Abie is a Filipina, a librarian, an MBA-holder, and a black belt in aikido. She obtained her MLIS in Japan, where she is also now finishing her PhD. Her mother is a librarian, her sister is a librarian, and her husband is a librarian! I first "met" Abie through the Filipino Librarians Googlegroup. But it was not until she came to visit last Christmas that we finally met in person. The most interesting story she told me was about the time when she was still the chief librarian of a public library in Manila. When she took over the small library, she found out that the library had so many employees whom she had never met. It turns out they were actually "15-30" employees—those who showed up only to collect their salaries on the 15th and 30th of every month. Well, she put them all to work. And when the 15-30 employees realized that they had to work for their salaries, they all eventually asked to be transferred to other departments. They all returned when Abie left for Japan. Why are public libraries in the Philippines in such a sad state? There are many reasons, of course. But I wish we had many more librarians like Abie. I can afford to live here and help people at the same time. I'm married to a Filipina who doesn't want to move to the states. I like the people here also. I also love the weather. Finally, Rick summarizes by saying that, "All in all, this is the best place I've ever lived." Read the entire post—which I found through my Technorati subscription—here. Meanwhile, Rickey uses his sidebar to direct readers to Google's search results for the phrase "Filipinos are known for..." Check it out. The author is my student. I considered editing the paper, but decided that it would be better to leave it as is, except to add the links to the original paper. Do libraries matter in the world of Google and Amazon? Basically, this is the question in Ken Chad's and Paul Miller's paper “Do Libraries Matter: The Rise of Library 2.0” (pdf, html). They answered yes, libraries matter. There is, however, a hitch. In order to continue being relevant, the library must keep up with the way Internet-based services provide information – to offer ready-access from any place, at any point in time. “Access to information from anywhere at any time.” Apparently, this is the guideline or motto for Library 2.0 that Chad and Miller proposes in their paper. At the point of need, information seekers can access the library through the Internet. They would not have to physically be in the library in order to gain a desired information – minimizing the problem of limited library hours. The question for us is, “Does the UP Main Library need this type of service?” Library 2.0 is applicable and useful for libraries in rich countries like the UK. But for libraries in a third world country like ours, I don't think we need to employ this type of service. The UP Main Library is an academic library catering to the needs of its student population. Limited opening hours – mentioned by Chad and Miller to be a limitation – is not necessarily a limitation for academic libraries. If we consider the academic loads of students, I don't think that the current library hours is a hindrance to providing service. Even if a student enrolls with a maximum load, he or she will still have time to visit the library and find the information she needs. As mentioned above, our patrons are students. From a scale of 1 to 10, how many student have access to the Internet? How many have their own computers? And for those who have computers, how many have a connection to the World Wide Web? How many students access the Internet through computer shops? Considering the questions above, we must note their financial capabilities if we are indeed thinking providing for a service like Library 2.0. Not all students will be able to access an on-line type of service. Not all students will be able to fully utilize and take advantage it. Cost and maintenance is also another factor we need to look into in employing Library 2.0. How much will the library spend in order to implement this type of service? How much will its maintenance cost and how often will it be done? Who will be responsible for maintenance? Even if Library 2.0 uses a mash-up of free applications available through the Internet and the library can avail this type of service and its maintenance, we will go back to the topic of misdirected goal. We might be able to employ this type of service but will it serve its purpose of providing information to a larger population, or even to all, of our patrons? I believe not. Not in the UP academic library setting. Bios and records of Pacquiao and Morales, plus analysis, statistics, and photos. Website devoted to Pacquiao has latest news from different sources, plus information about all previous fights and forum for his fans. 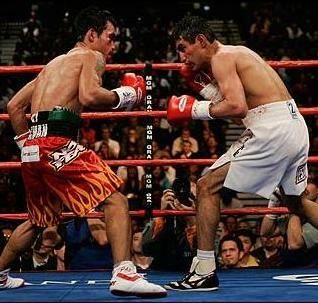 Watch a preview of Pacquiao-Morales II, videos of Pacquiao's most memorable fights set to the music of Bamboo's "Noypi," Pacquio knocking down Juan Manuel Marquez several times, and even Pacquiao among the greatest fighters in recent times. Overview of boxing in the Philippines includes news, bios of current and former champions, and a special 30th anniversary feature on Muhammad Ali and Joe Frazier's "Thrilla in Manila." The previous post on "Journals" has been updated to include the Journal of Asian Missions. Library 2.0: What's in a Name? What's Library 2.0? Check out "Library 2.0 and 'Library 2.0'" by Walt Crawford (Cites & Insights  6:2). It's quite long, so if you'd like to print it out, please read Crawford's advice regarding printing. If there is a Library 2.0 (or L2, as some have begun calling it), then there must be a Library 1.0 (henceforth, L1). But what might L1 be? Could it be that L2 refers to the new, and L1 to the old? Could it be that what has happened recently is so revolutionary that it justifies dividing the development of libraries into L2 and L1? Is it possible that Jesus Christ the librarian has just been born? If you are offended by that last question, perhaps you can begin to understand why some have taken offense at the term "Library 2.0." Some have asked whether L2 means that nothing that came before was considered revolutionary, and cite the invention of the card catalog as an example. Could it be that everything that preceded L2 was evolutionary in nature? What's in a name? AD and BC are very familiar to most people. Christians will probably say that AD stands for After the Death of Christ, and that BC stands for Before Christ. But what about the Muslims and the other non-Christians? Should we, in fact, measure time according to the life and death of a God-man who is important only to a minority? This is the reason the terms CE (Common Era) and BCE (Before the Common Era) have begun to be used. Guess what? You probably haven't heard of CE and BCE because they haven't quite caught on. After centuries of AD and BC, it looks like this division of time—whether rightly or wrongly—is here to stay. But no, this post is not about religion. It's about names—the need to describe what we perceive and put a label on them. Some people dislike being labeled. Maybe you're a baby boomer. Perhaps you're a member of Gen X. I suppose I'm a Martial Law baby (if you're not Filipino, you probably won't know what this is), but I wouldn't really identify myself as such. But it cannot be denied that names are necessary. We need to call the different pieces of furniture we have in our houses different names. After all, if we called everything "chair" just because we find them in houses, how would we differentiate between what we now know as table, cabinet, door, chair? Or should we just point at things with our fingers? We need a name for where we are now. We need names for the various "eras" of librarianship. It can be L2 and L1; or the Tech, Card, and Parchment Eras; or the Scroll, Book and Web Stages, etc., but I think librarianship—or is it the information profession?—has matured enough to start giving such names. It's possible that such names have been given before, but how come I don't hear them much? Who will decide which terms will become AD and BC for our profession? In scientific revolutions, competing paradigms are presented and the "fittest" paradigm survives—along with the terminology it employs. But does our field even have competing paradigms? [What's a paradigm, anyway? "A way of looking" is the simplest definition I can give at this time when I don't want to start quoting Kuhn or Covey .] The closest we have, I think, are LCC and DDC, but I don't think the triumph of one over the other—they seem to be coexisting very well—will count as a revolution. Who will decide? We all will. But it will probably take a long time. I hope the proponents of L2 will start clarifying their thoughts, take into account the criticisms, and start coming up with a paradigm. I also hope that those who are offended by L2 will come up with an alternative name and propose a competing paradigm. And then, maybe we can start a real debate. What will I do? I'm going to sleep. I still have to explain L2 to my students tomorrow. What profession is denoted by the initials DVM? 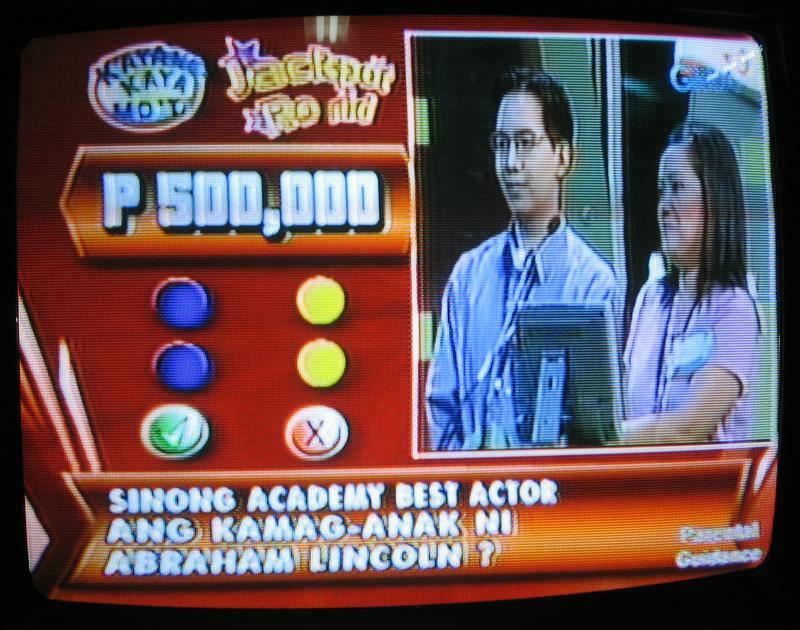 Which Oscar-winning actor is related to Abraham Lincoln? Which Filipino president was from Region 6? The answers: Veterinarian, Tom Hanks, and Manuel Roxas. What's so good about YouTube is that there's no need to download anything. All that users have to do is wait until the video is ready to play, and just play it. Some might not like the thought of being unable to download copies of their favorite videos, but YouTube has not been called the Flickr of video for nothing. Just about everything you can do with photos on Flickr may also be done on YouTube. 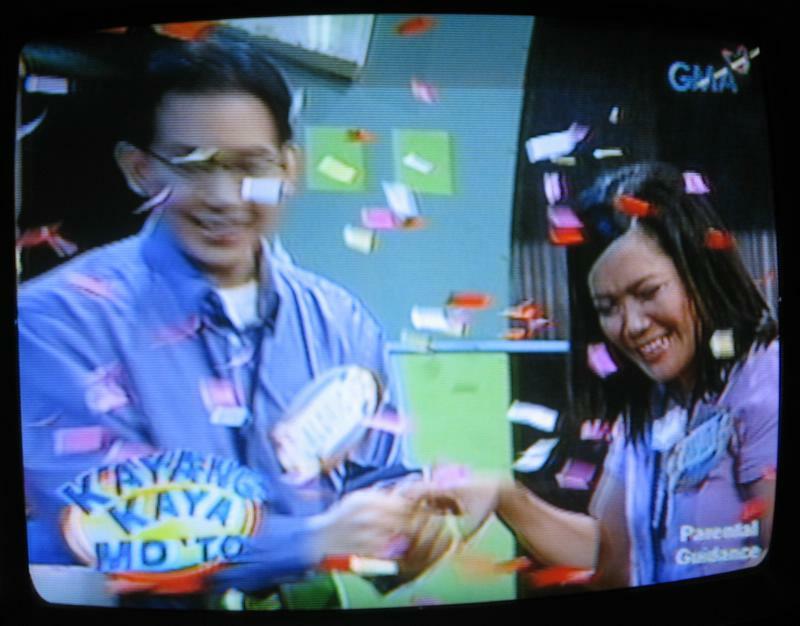 When I wrote "Biyahe Tayo!" I planned to translate the lyrics into English, but gave up. Well, thanks to YouTube, not only can you watch the original video, you can also watch the shorter version with English subtitles. The less appealing Regine Velasquez TV ad is also available. 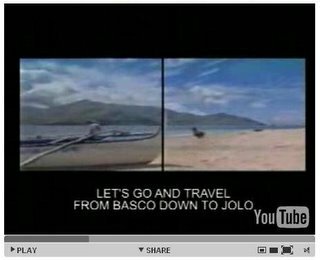 Incidentally, to clear up a point that was not so clear in my previous post about the original video, the song was composed by Rico Blanco and Mike Villegas, while the lyrics were written by Mike Nieva. There are currently no videos available on Filipino libraries or librarians, but there are quite a few on foreign libraries and librarians (see "Conan the Librarian"). There are also a lot of videos from "Pinoy Big Brother," Filipino soap operas, music videos and even scandals. If you missed something on TV that everyone's talking about, don't just search Google Video, go to YouTube and interact with all the others who saw it. That's how I found "Magmahal Muli" as performed by Sam and Say for Big Brother. This post is dedicated to Sassy Lawyer, who has said, "sana nga i can find the 'Scrap the VFA' and the 'Dissecting the anti-terror bill' entries," and all those who have lost or might lose a page or more of their web archives in the future. Sassy Lawyer lost more than two years worth of her archives over the holidays, recovered most of it with the help of her many friends, but gave up on her posts between 17 August 2005 and 17 December 2005. Recently, however, Basangpanaginip came up with bits and pieces—in some cases, entire posts with comments—of the missing posts by searching Yahoo! and MSN and linking to the cached pages. If you, like most people, ignore the word "cached" (see word encircled in image below) when you use search engines, think again. A cached page is the "snapshot" taken by search engines of a web page. Search engines use these snapshots to index websites. Clicking on the word "cached" may be necessary when a particular page is not available for various reasons—like the host is temporarily down... or the blogger lost her files by mistake. Not all search engines, however, provide access to cached pages. In fact, just in case you are not aware of it, not all search engines are the same. Some index only certain pages and different search engines will, of course, come up with different results. And this is why experienced searchers will use more than one search engine. Some even recommend particular search engines for specific needs. Finally, there are other search engines. Yes, in case you didn't understand that the first time, there are other search engines. One of them is Gigablast, whose Blog Search is in beta right now. Yes, it provides access to cached pages. And yes, Sassy Lawyer's posts on "Scrap the VFA" (Page 1 2 3 4 5 Comments) and "Dissecting the anti-terror bill" (Page 1 2 3 Comments) are still available on Gigablast. Unfortunately, not all the pages were cached. But clicking on "cached" and using Gigablast—and other search engines—may be a way of recovering inaccessible or "lost" pages. Ghee Horie is a Filipina who lives in Japan with her Japanese husband and two kids. She is a certified English teacher and holds classes for her Japanese students—from 3 to 50 years old—in her living room. I have not met most of those who comment on my posts. The few I have met are those whom I already knew even before they started leaving comments. Ghee is, I believe, the first commenter whom I have met through this blog. We had lunch when she arrived last month and visited Aklatang Pambata. Photo taken at Caleruega-Philippines, Nasugbu, Batangas. 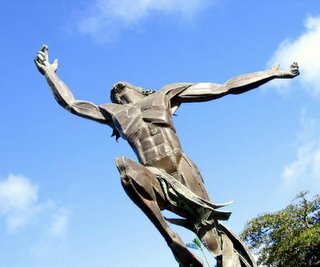 In "All will be well" (Philippine Daily Inquirer, 4 January 2006), Michael L. Tan says, "I've often heard Filipinos complain that we're doomed for failure because of our bahala na [God will provide] mentality, which is misinterpreted as fatalism... if we do invoke bahala na, it's often only after we've made many attempts to solve a problem. Yes, we sigh, 'Bahala na,' but we also assure those in need, in crisis: 'Gagawa tayo ng paraan' (We'll find a way). That's why I believe that with time, all will be well." The Millennium Development Goals, which "range from halving extreme poverty to halting the spread of HIV/AIDS and providing universal primary education, all by the target date of 2015," are probably not very familiar to many Filipinos. MDG, its acronym, will likely not be easily recognizable, either. Data on progress made by the Philippines since the MDGs were adopted are available through UNDP and NSCB. The goals are noble, but why should Filipinos care? Well, Filipinos care very much about music, especially if celebrities are involved. And that, I believe, is the reason that there is now such a thing as an MDG Album. With artists like Sharon Cuneta, Gary Valenciano, Lea Salonga, Martin Nievera, and Sarah Geronimo involved, how can Filipinos not pay attention? Sadly, the songs do not seem to have become more widely known. Perhaps because the songs are not available? 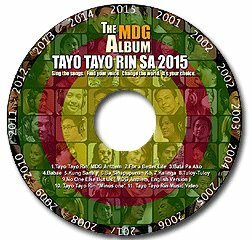 When I first read about the album through "UN agency turns to Pinoy music to fight poverty" by Volt Contreras (Philippine Daily Inquirer, 23 October 2005), I wanted to write about it but couldn't find anything online beyond news articles. I eventually forgot about it. Finally, I hope you will tell other people about it.